I have encountered this many times on PS4. It occurs in Phase One of Infiltration (the space battle called 'The Approach'). In the latter stages of Phase One, if the rebels have 3 U-wings, eventually if they are all destroyed the game tries to spawn 4 players as U-wings. My understanding is that the maximum number of U-wings is /should be 3 (please correct me if I am wrong). 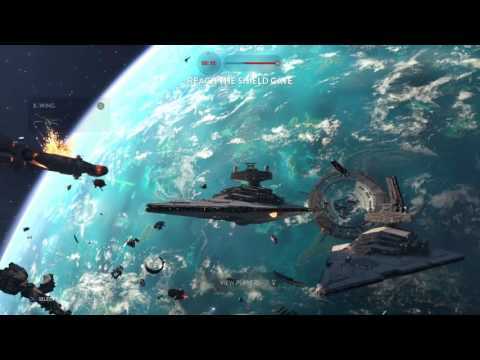 This results in 3 players spawning in U-wings and the 4th player remaining in his X-wing as shown in my video below. The yellow text in the top right of the screen clearly states that I had been chosen to fly a U-wing but nothing happened. Towards the end of this video you will also see that I was receiving a 'U-wing Transport Bonus' despite being in my X-wing. Same thing has happened to me twice as rebels (ps4). Both times I was able to fly my U/X-Wing unopposed to the shield opening. As imperial I have had matches where all U-Wings appear to be destroyed yet we still lose the round so I am fairly sure that the bugged U/X-Wing does not get flagged for attack/defend. I have seen this same glitch when I was playing as an Imperial. 4 rebels spawned purportedly as U-wings but one of the 4 was still in an X-wing despite having the big Blue objective marker over him. I shot him down to see what would happen but it just appeared to be a normal X-wing kill/score.